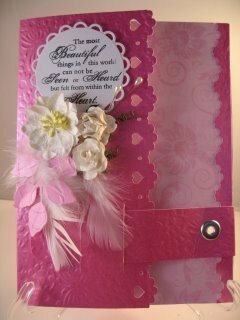 This Tab Card Tutorial will give you yet another look that you may like to add to your repertoire. 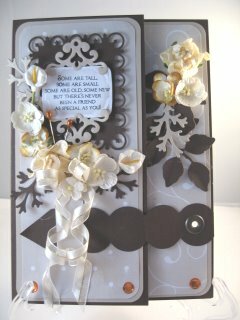 And the more ideas and techniques you can add then it will keep your interest in cardmaking alive. There are so many ideas and most of them are easy to do. They make take a little practise until you feel confident enough to try them on your very "best" card but that won't take long to achieve. We all have different ways that we enjoy learning and for me it is the visual aspect. But for others it is reading what they need to do and so here are the written instructions for the Tab Card. You will see several ways to make the card look pretty. Look at the stuff you have in your "Stash" and make it work for you. It can be used for male or female cards and will suit any occasion you may like to send it. To create the shape to the tab you could use any punches that you have or leave it plain if that is what you want to do. For mine I have used the "Edgeabilities" from Spellbinders to create the shape. And for a really good place to buy them at discount prices take a look here at Scrap-Mart. There are many shapes to these dies and they are so versatile. And the best part of cardmaking is being able to play with all kinds of things and seeing what happens.